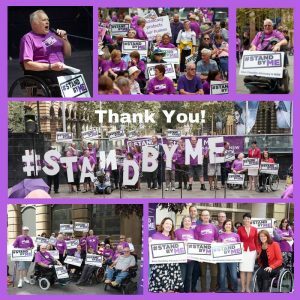 The Stand By Me campaign to save disability advocacy funding in NSW was relaunched today, this time with the determined goal of acquiring a commitment from ALL political parties to fund disability advocacy in the long-term. PDCN’s Serena Ovens, standing alongside fellow Disability Advocacy Alliance members including Matthew Bowden from People With Disability Australia, Jim Simpson from the Council for Intellectual Disability and PDCN Board member Michael Rabbitt, gave an opening statement to the media outside Parliament House, coinciding with today’s parliamentary hearings into the NDIS and disability services. “Today I stand here on behalf of the NSW Disability Advocacy Alliance appalled by the Berejiklian government’s planned cuts to disability advocacy, information and peak funding in June 2020, leaving 90% of people with a disability without vital support within the next two years. 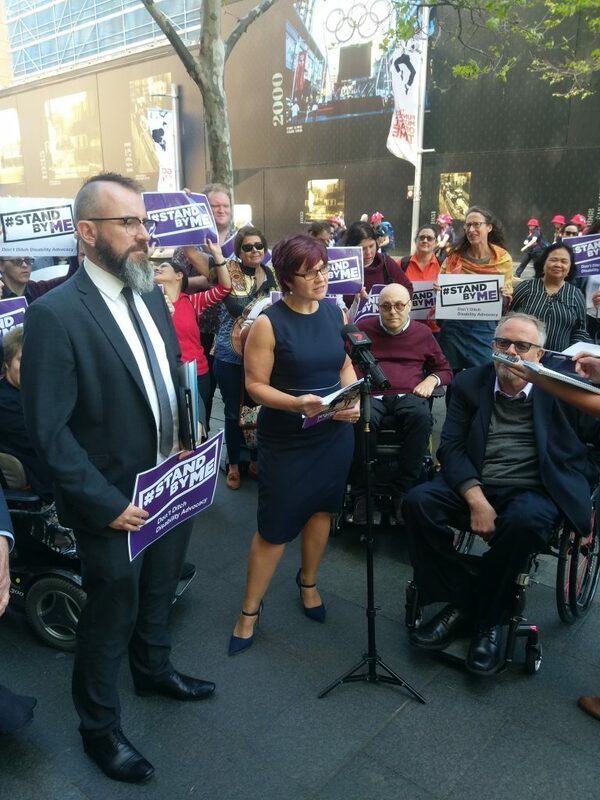 Without disability advocacy and peak bodies, many people with disability will fall through the cracks, ending up incarcerated, homeless or in hospital – putting lives at risk and placing significantly greater stress on the NSW public purse. To give you an example, a member recently deemed ineligible for the NDIS, and having had his previous community support services cut, was unable to care for himself adequately at home, became ill and had to be hospitalised – where he has had to remain as he is unable to return to his home without support. We know that investing in disability advocacy leads to a range of benefits, including improved educational and employment outcomes, frees up justice, health and accommodation services, and saves lives. This also means that there will be no-one for the government to consult with on behalf of people with disability on issues like accessibility, discrimination, transport, housing – you name it! 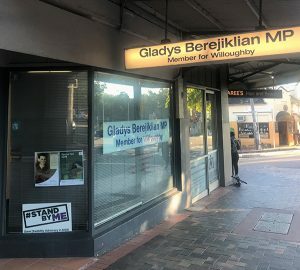 The government says there is transitional funding – but transitional to WHAT for the 90% of people with disability in NSW who won’t receive an NDIS package? The Minister Ray Williams states that he will monitor people to make sure that no-one ‘falls through the cracks’ – but how will he do this when the government has closed ADHC services this past June? He says the NDIS will take care of it – but the NDIS clearly states it will not fund advocacy – even for the 10% of people with a disability in the scheme. There are 1.37 million people with disability in NSW, 20% of the population, and we need long-term, secure advocacy funding so that whether we’re in Wagga, Lismore, Wollongong or Sydney our rights are met. One in five people in NSW have a disability, and we are in every corner of the state. This isn’t a niche issue that politicians can turn their backs on. People with disability vote! These are vital services that we can’t let the government axe for what is a drop in the bucket in their overall budget – if the NSW government doesn’t commit to funding these services they are essentially turning their back on people with disability – silencing the voice of people with disability, leaving a huge gap in services and putting many lives at risk.